This is one of my favorite kuzhambu. 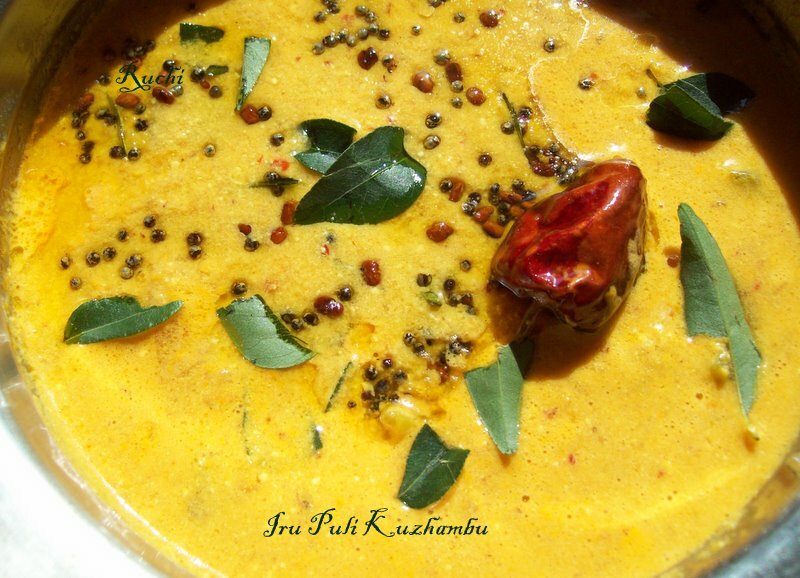 I love this kuzhambu for its spicy and tanginess.It is a tangy gravy with a delightful mix of spice ,butter milk and vegetables.. We are using both butter milk and tamarind to make this kuzhambu and so its called iru puli kuzhambu. It is a very popular dish among the Tamil Brahmin and Kerala community. This unsual kuzhambu made with coconut ,roasted with fenugreek seeds and dried red chillies and cooked along with tamarind paste, makes it deliciously tangy and spicy.We can add a variety of vegetables can be used for this recipe. It goes very well with paruppu usili, roasted chepankizhangu, vazhakkai , any type spicy curry and with hot rice, dosa’s ,idli as well. 1. Soak 1 teaspoon of raw rice in water for about 10-15 mins. 9. Heat oil in separate pan and add mustard seeds. When the mustard seeds begins to sputter add curry leaves and fry for a while and add these to the Iru puli Kuzhambu. 10.The mouth-watering iru puli kuzhambu is ready serve it with Hot rice and spicy vegetable. nice and tempting recipe.. looks amazing.. thanks for sharing !! Yumm, tongue tickling kuzhambu,soooo tempting! this is totally new to me! i love the ingredients that go in. i am making this over the weekend!